The power of GraphQL lies in its flexibility. That is especially the case regarding resolvers, where any local or remote data can be used to fulfill a GraphQL query or mutation. 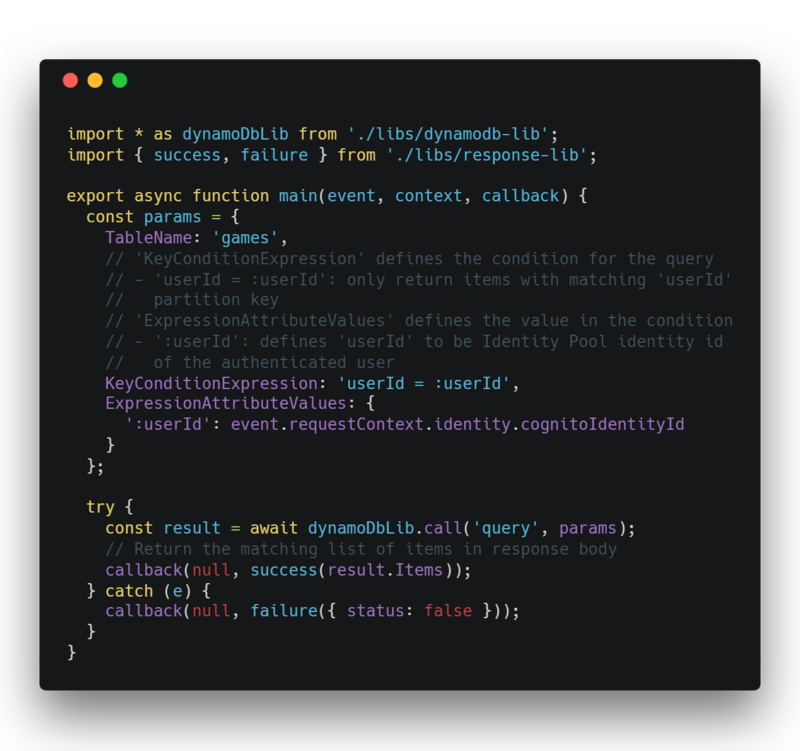 In this post, I’m going to demo a quick example of what this looks like, and a couple gotchas that were apparent in working with Lambdas as a datasource for AppSync. Let’s gooooo! 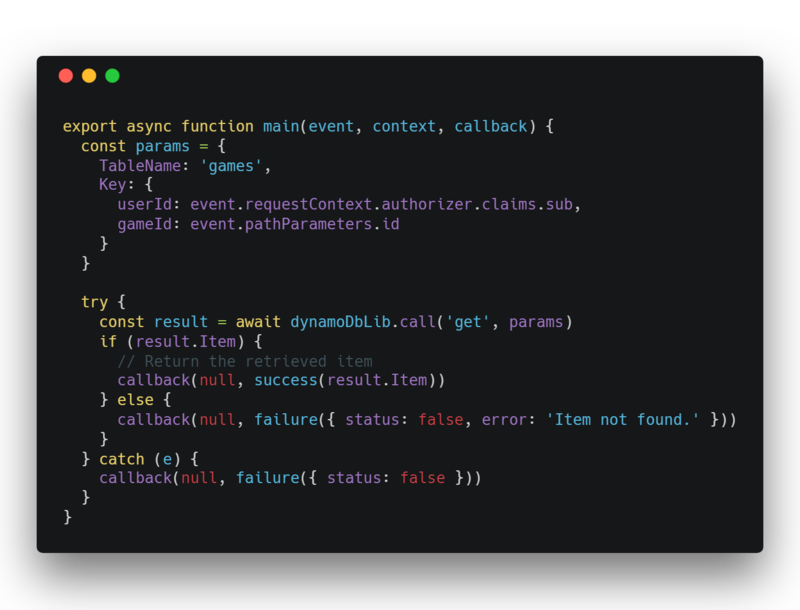 I’m not going to get into the basics of setting up lambdas in this post, but I will point anyone over to the Serverless Stack tutorial. It is fantastic and I highly recommend getting familiar with it before moving to setup a Lambda data source with AppSync. For this walkthrough, I’m going to assume you have a basic serverless stack deployed so you have some Lambda functions available for use in an AppSync API. The one I am using for this demo is slightly modified to use Cognito for user authorization. This provides us with the user IDs needed to create our Game objects used in the API. You can find the code for it here. It has basic CRUD functionality for games and their associated reviews. We’re going to modify these to work with AppSync, while still maintaining the ability for our API to be used as a REST API if needed. This is the promise of GraphQL — adapting all data sources to be as one in a schema. The API is used in this example app demonstrating the basics of AWS Amplify. It has some reviews that are based in AppSync, but we want the GraphQL API to resolve our games as well. 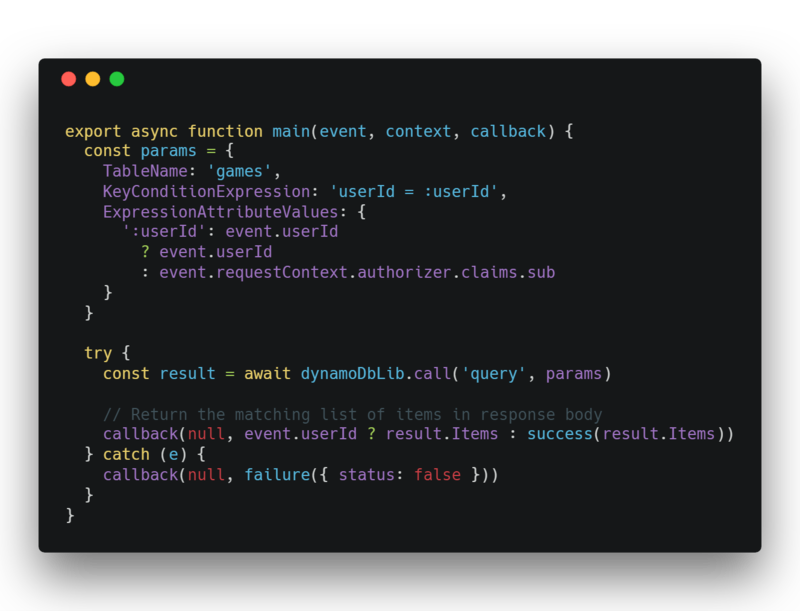 We’ll use this opportunity to show how to adapt a serverless REST API to resolve GraphQL queries in AppSync, while maintaining the backward-compatibility of using it as a RESTful endpoint. This is very basic, just for our needs at the moment. If you’re using the Notes API from the tutorial, or some other API you created, modify this to fit your needs. Next, in the AppSync console, create the Query that we’ll use to fetch our GameItem list. Save the schema. That was easy. Now it’s time to wire up the resolver to our lambda data source. Note: I’m assuming that you’ve already deployed the serverless API you’re using for this. If you’re following along, make sure to do that before continuing. Click on Data Sources in the top left of the console to open the list. Click the New button in the top right to open the form and type a name into the box. I’m calling mine GamesFunction. We’ll start with the list function so we can return our list of GameItems. The form should look something like this. Click Create and head back to the Schema section. The next step is to setup the resolver that will use our newly created lambda data source. Scroll down to the query section and click the button to Attach a resolver. This is retrieving all games for a given user. We need a way to pass in the userId. 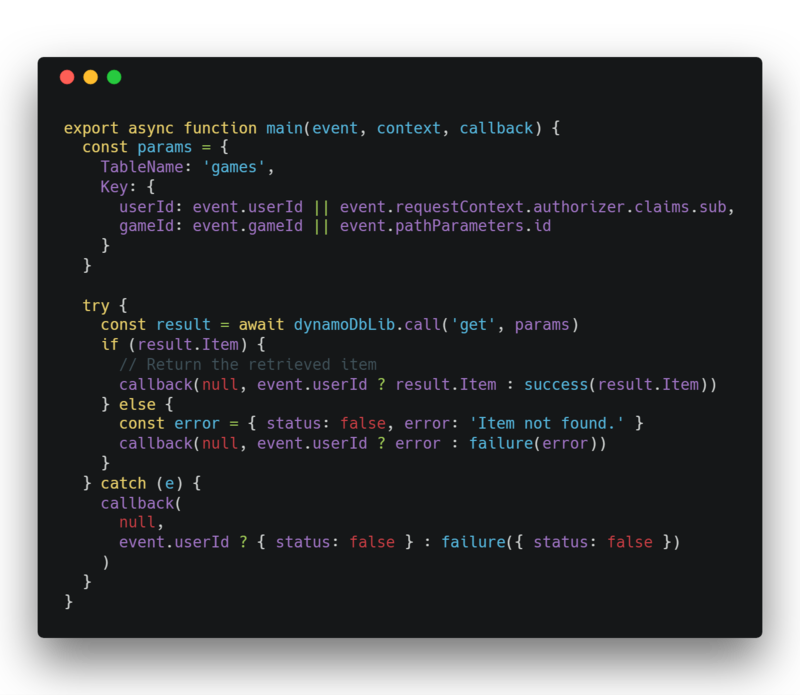 Through our serverless API, the authentication will automatically be handled for us and the event object will already contain everything we need. With AppSync, we have to adjust how we’re handling this. As the request mapping template states, the payload will be passed in as the event. So let’s first update the payload to contain the identity of the user. We can get this from the identity context sub property. We can now key off this difference, and adjust accordingly. There are two things of note in this case. We’re using the userId to look up the list of games. In the ExpressAttributeValues, we’ll use the userId property if it’s directly on the event object— which will be the case if we’re calling it from our GraphQL API resolver. In the callback, after we retrieve the result, we’re again checking against whether our userId property exists. If so, we pass the result.Items back to our GraphQL response mapper, else we wrap it in our success handler to provide a nice response to the client that called our API endpoint. Deploy this change and then head to the Query tab in AppSync. Assuming you have the authentication settings set to Cognito User Pools, login to the console with a user that has some games in the database. If this isn’t the case, take a minute to load up the app, and add a game or two using the example app. Once you’re all set, try to run the following Query (or equivalent for your schema). With any luck, it works! You should see the same list of games that your app is retrieving using the REST API — but you’re resolving it with GraphQL! You can adjust which properties are sent back by changing the fields requested in the query, just like you would expect. Let’s add one more resolver so we know we’re getting the hang of this. 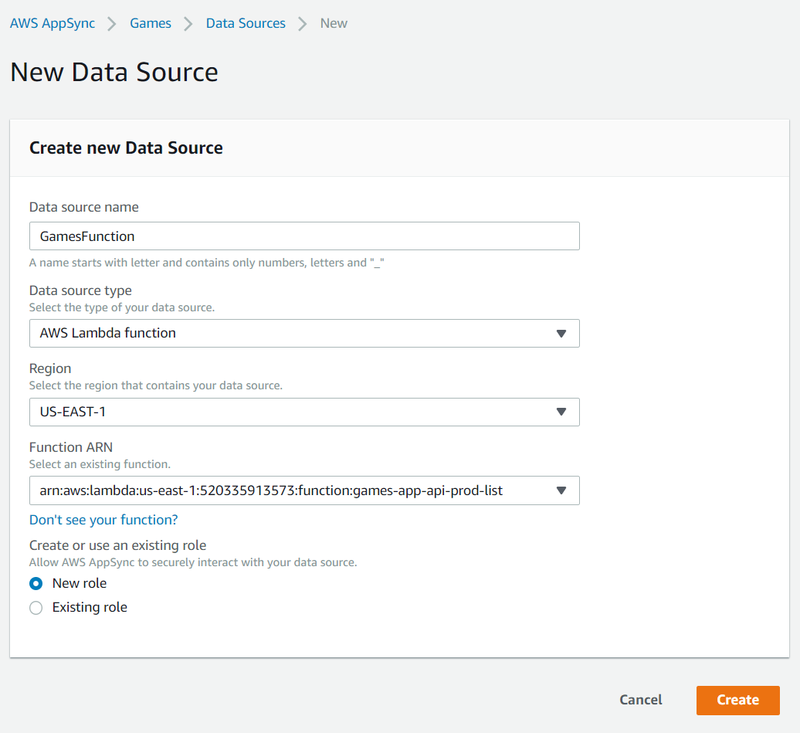 Head back to the Data Sources section and press the big orange New button to create another data source. We’ll call this one GameFunction because we’re going to be retrieving a single game. Press Create. We already have a type for our GameItem, so we just need to add a Query. Save the Schema. Head to the Query in the Resolvers panel and click Attach. We need to modify the request mapping template like before. This time we’re passing in an argument for the Game’s ID, so we’ll handle that as well. Like the previous list resolver, we’re setting up the userId. Here, we’re also setting up a property called gameId. We’ll use this as a key in our lambda as well to provide some conditional logic. We essentially just want to use the success helper when we’re returning to the REST endpoint, and not use it otherwise. Also, there are some naive parts about this, but that’s okay for this demo. If you were doing many of these, you could probably extract this to a helper that would handle a key of some kind or even use a library like Middy to add some middleware logic. Head to the Queries section and try it out! If you have the right logged-in user and id, you should see a result with our data resolved through the Lambda. Huzzah! "message": "Cannot return null for non-nullable type: 'ID' within parent 'GameItem' (/fetchGame/gameId)"
This is ugly, and we already have a nice error message returning from our Lambda that is used with our RESTful endpoint. Let’s look at using that instead so we can provide a helpful message that let’s us know when a Game could not be found by the ID provided. This is a much better error, and can return an expected result in cases we want, like this one. I hope this helped demystify the process of hooking up a lambda function to an API. This really helps with re-use and allows for backwards compatibility to ensure your previous apps can continue to work correctly. Lambda is the gateway to the outside world from AppSync. 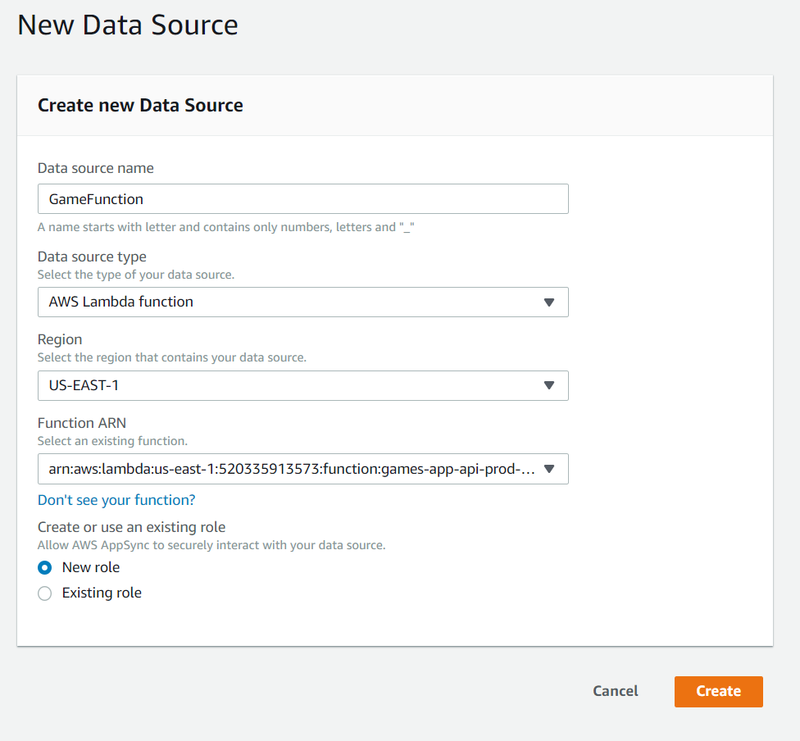 Sure, in this example we’re only calling to DynamoDB, but we could call to any other datasource, be it another database, another AWS service, or any external API we want! You get all the ease that AppSync provides, while being able to hook into any existing data that you need. Give it a try and let me know how it goes in the comments below! My name is Mat Warger, and I’m a developer at Keyhole Software. Thoughts here are my own. If you liked this article, please clap for it and share it with your friends. I love writing about exciting new technology, so follow here or on twitter as well if you’re so inclined!